I'm Fraction Calculator Plus and I'm the best and easiest way to deal with everyday fraction problems. Whether you're checking homework, preparing recipes, or working on craft or even construction projects, I can help: Wish you could find the time to check your kids' math homework? Now checking fraction math takes just seconds. Need to adjust recipe quantities for a larger guest list? Let me adjust your cup and teaspoon quantities. Working on a craft or home project in inches? Stop double-or-triple calculating on paper - let me do it once, accurately. 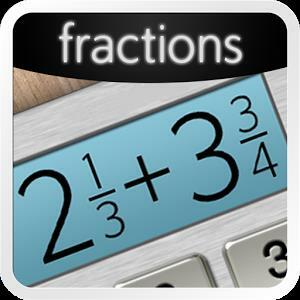 Fraction calculator with step-by-step operations and algebra. Shows results as you type. Use space to enter mixed fractions. Graphical display of expressions with history.